With the filling out of the way, the other half of potstickers is the wonton wrappers. No problem, just head over to your local Whole Foods and pick some up… oh wait, the ones at whole foods have eggs. Bummer. That's okay. Sprouts is just down the street. I'm sure they'll have vegan wonton wrapp… nope, these have eggs too. Ugh. Yeah, in the end I had to make my own wrappers because I couldn't find any vegan ones locally (your mileage may vary). I've included the recipe below and it's amazingly simple! Just flour, salt, and water, rolled out very thin with a rolling pin or pasta maker. 20 minutes, tops, and they'll taste so much fresher than the stupid store-bought wonton wrappers anyways. To make these wrappers, combine the flour, salt, and water in a bowl and use your hands to knead together until the water is absorbed. This will be very thick and it will take several minutes. Then, split the dough into 2-3 balls and roll out very thin on a lightly-floured surface. You'll want this to be literally as thin as you can make it – use as much time and elbow grease as necessary (or just use that pasta maker you have tucked away in a drawer somewhere…). Then, cut into 3″ x 3″ squares and place on foil or parchment paper. They can be stored in the fridge for up to a day. In a skillet, combine the sliced mushrooms with a tablespoon of soy sauce and simply allow them to soften and partially cook for just 5 minutes. Meanwhile, roughly chop the carrot and green onions (saving one for garnish) and add them to a food processor with most of the other ingredients: sunflower kernels, parsley, sesame oil, cayenne pepper, and smoked paprika. Pulse until somewhat broken down. Then, add in the softened mushrooms (with the soy sauce from the pan) and a cup of rinsed/drained pinto beans. Pulse a few more times until no large pieces remain. Taste and adjust seasonings as needed. This is delicious by itself and works amazingly well as taco meat in corn tortillas. If making ahead of time, store refrigerated for up to 2 days. 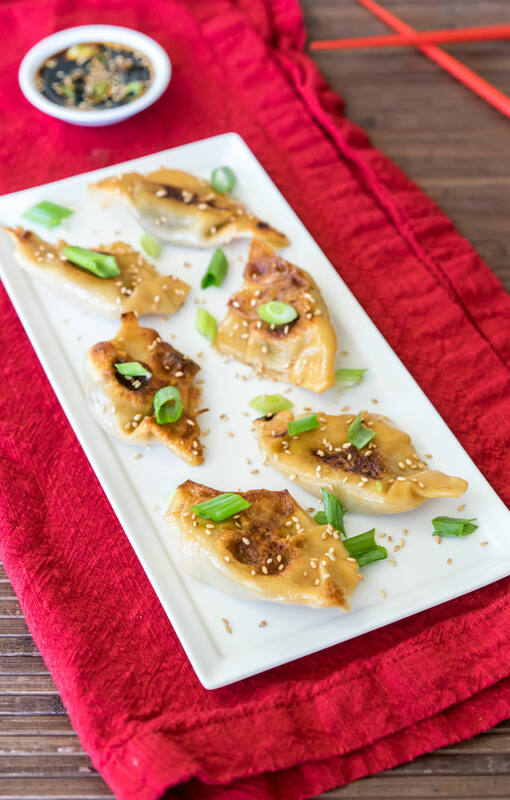 To assemble the potstickers themselves, lay out one of the square wrappers and place just 1/2 – 1 teaspoon of the filling into the center. Dip your finger into a bowl of water and wet the four edges. Pull one corner to the opposite corner, tucking the filling inside and creating a triangle, then crimp/pleat the seams and squeeze the seams tightly to seal. 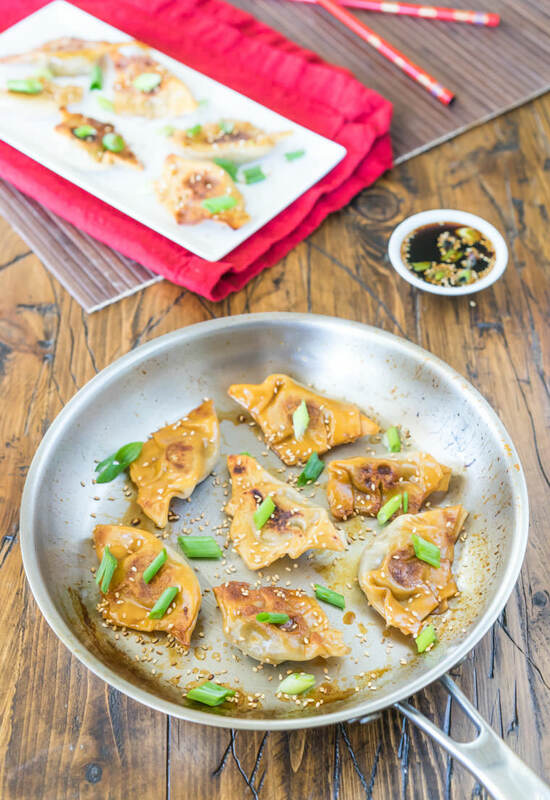 With all the potstickers ready to go, heat a large 10-12″ skillet with a tiny bit of vegetable oil and bring up to medium-high heat. Place about 7-9 potstickers onto the hot surface and let them stick and cook for 2 minutes (and get a lid ready). After 2 minutes, carefully pour about 1/4 cup of water into the pan (it will boil immediately and sound terrifying, that's okay) add a teaspoon of soy sauce as well, then cover with the lid and cook for 2 more minutes (a covered pan is essential, as it will allow the steam to finish cooking the wrappers). Sidenote: typically you would use broth to finish these off, but I love using water plus soy sauce because the soy will cook into the wrappers, giving them a bit more flavor and a much more golden and impressive appearance. Finally, plate with a sprinkle of sesame seeds, some sliced green onions, and a bit of soy sauce mixed with maple syrup. Read this next: Can a child thrive on a vegan diet?